Business conferences, trips, sports, and recreational activities - the ‘always busy’ team of Redwoods Advance is full of activities throughout the year. Here, are details of the latest Redwoods Singapore events, from May-June 2014. Have a look to know, what the busy-bee was up to in the previous months. Redwoods Advance attracts and retains the best employees and considers everyone an integral part of the company's mission. 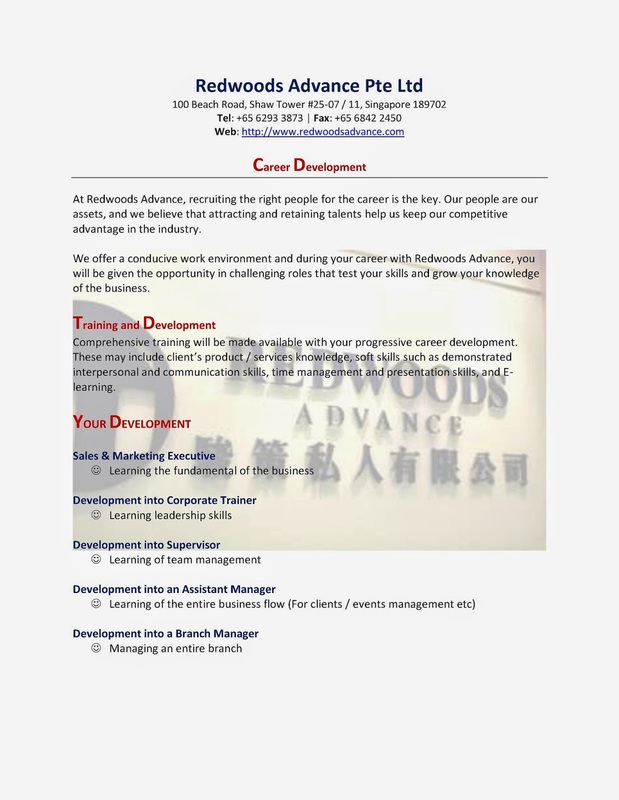 Join Redwoods Singapore for a prosperous sales and marketing career. Redwoods Advance extends everyone with the opportunity to excel in a sales and marketing career. Show your potential as an employee and there will be no looking back in your career. 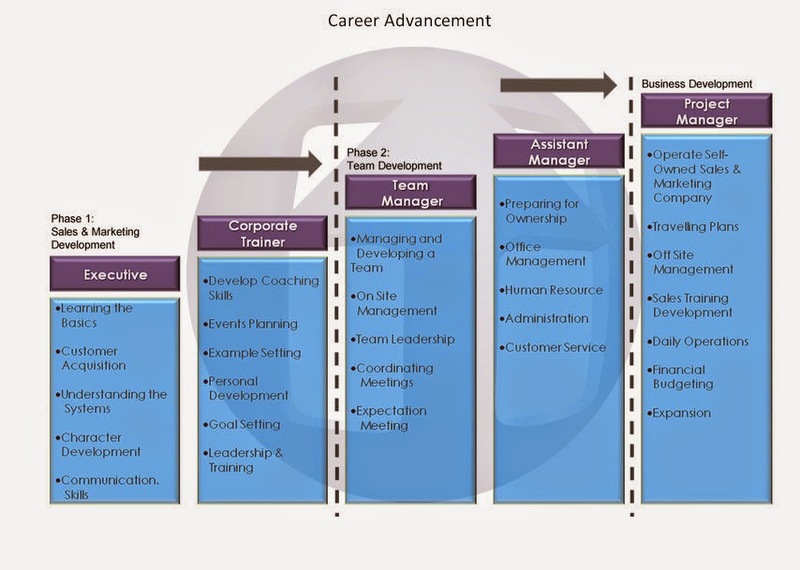 Have a look at the Redwoods Advance Career Progression chart. We are recruiting new talents. Everyone who wants to join the sales and marketing career path with Redwoods Advance should wait no more. Find herewith the career development programme, to know - how one progresses with the organisation. 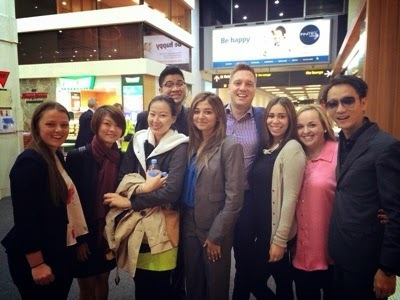 With lots of business and leisure trips, it has so far been an eventful year for everyone at Redwoods Advance Pte Ltd.
After the Indonesia and Kuala Lumpur visits recently, the Singapore Sales and Marketing Company was on Business trip to Australia (from June 16 to June 22, 2014) with the outstanding performers from the organization. The seven-day, six-night learning trip to Sydney and Melbourne in Australia has been a memorable experience for all. The Redwoods Singapore team visited the Australian Headquarters, networked with business leaders and socialized with associates from the marketing offices, there. During the trip, the Redwoods team visited the Opera House, Sydney Harbour and hit various popular destinations in Australia. Delegates even decided to self-cook one day and had a gala dinner in the group. The Singapore Sales and Marketing Company – Redwoods Advance had its Annual Sports Day on Monday 2nd June 2014. ‘Redwoods Advance Pte Ltd’ decided for the - ‘multi-purpose’ Bishan stadium in Singapore, for corporate team building sports and fun-filled group activities. Sports arena or a professional field - to win, one should work together and be a part of the team. Redwoods Advance members wore yellow colored T shirts to represent their team, during the eventful day. Started off with the fun dance, people played different games and demonstrated their team bonding skills. Tug-of-war, 4x100 m relay, 100 m and 400 m, fun races and cheerleading sessions were attractions of the day. Everyone had a gala time at Bishan Stadium, Singapore during the Sports Day. Life is a Journey – do not be a Tourist, be a Traveler. For everyone who works for the Singapore Sales and Marketing Company – Redwoods Advance Pte Ltd, journeys and trips to distant lands are not a ‘new thing’. Be it educational tours, adventure or sightseeing expeditions, road-trips to other Asian countries - Travel remains always on the cards for people at Redwoods Singapore. Thailand Phuket was in the ‘travel list’ for the Redwoods Advance Singapore team from 20th to 24th May 2014. The reason was – R&R Award Dinner and Asian Administrators Conference. As ever, the journey was a time to explore and experience different things in Thailand Phuket. Delegates from different countries got together at Le Meridien Hotel, Phuket for the business conference. People networked and socialized with company representatives from different countries. To recognize and honor 'organizational talents' - Redwoods Advance Singapore even organized a black-tie themed dinner/cocktail party. Amid lots of cheers and wishes, people enjoyed the ceremonial dinner and had a gala time. During the spare time – everyone even went for a swim in the pool, tried spa treatment at the health resort and ‘let loose’ the purse strings for lots of shopping at the malls, there.